By some official counts, there are 72 separatist secessionist movements in continental Europe. They range from the extreme which have already gained such an elevated measure of autonomy where they issue their own currency (Scotland), and which have come within a hair's breadth of actually breaking up their nation (Belgium), all the way down to comical and pathetic attempts such as Italy's Southern Action League which essentially is a family owned and run party whose patriarch is in the clink for Mafia crimes and whose separatist movement seems to only include a few blocks in the City of Taranto. As the recent Greek financial crisis has shown, there is a will in the European Union to uphold federalism, and although the European Union came perilously close to immolation a couple of months back due to wanton fiscal irresponsibility by the PIIGS (yeah, I know… that's a frowned upon acronym), the majority of Europeans are coming to the realization that the way out of the economic morass is more centrism and less reliance on self-serving narrow-minded national politics. Mayotte; Saint-Pierre and Miquelon; French Polynesia; Wallis and Futuna; Saint Barthelemy; Turks and Caicos; Montserrat; Falklands; Caymans; British Virgins; Anguilla; Aruba; the soon to be broken up Netherlands Antilles; and special cases like Greenland, New Caledonia, and Bermuda. These associated territories are like the USA's Guam or Puerto Rico: They're part of the overall nation, but do not hold official state status. How many people are aware that just 300 miles due east of Maine you can be on European Union ground at Saint-Pierre and Miquelon? Yes, these fully French islands are about an hour's flight from Boston! And how many people are actually aware that as of a couple of months from now, there will be a total of six places in the Western Hemisphere that aren't just "associated" but actual integral provinces of Europe (Bonaire, Saba, St. Eustatius, French Guiana, Guadeloupe, and Martinique)! 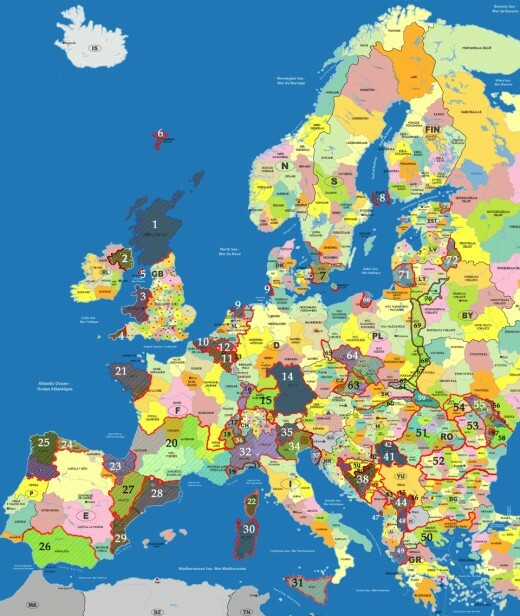 These places are administratively part of European nations, and when you're walking around on them, you are as much in "actual political" Europe as you would be if you were strolling down the Champs-Elysees in Paris, or Dam Square in Amsterdam! To stretch the USA comparison, these places no longer have the political status of Guam, as they are Hawaii. These European Union "interior provinces" are even present in the Indian Ocean, where Reunion is as much a part of European Union / France as Lyon! The European Union's global aspirations seem to extend much further than placid Caribbean backwaters. Now that rampant, insane, and vicious American xenophobia has slammed the door on the logical and way overdue union with Canada (which the Bush Administration was heading towards… until 9/11 and the myth of terrorists crossing the Canadian border), the coming European Union-Canada Free Trade Agreement seems to lay the building blocks for an European Union which is no longer European at all, but planetary. Canada is in a Free Trade Agreement with not just the USA and Mexico, but Chile and Peru as well. The ground is being set for a Chilean grape, a Mexican jalapeno, or a bottle of Canadian maple syrup to be easily and freely placed on grocers' shelves from Inverness to Palermo. With freedom of trade comes freedom of people moving from one area to the next, and before you know it, the "national boundaries" soon fade away. Global union is smart, and is what's needed. But it must be democratic, and protect against the present tyranny of the shadow world government (i.e.,the "new" world order which is really the old world order). Thus the Earth Federation under the Earth Constitution thanks to thirty plus years of quiet work by the World Constitution and Parliament Association which drafted a brilliant new world charter(constitution)to replace the obsolete UN charter and have a way to resolve world problems which seem intractable. It's just what Einstein and his ilk knew was needed: A democratic world federation with enforceable world law. Global union is possible. Only the rogue nations will resist -- along with those people who prefer violence and war to peace and love. There's no other way to eliminate weapons of mass destruction, war, or worldwide poverty. And it's our best hope in the USA to regain our individual rights. Again, it was not my intent to leave out any other bloc of countries, as the EU is clearly in the Caribbean, the South Pacific and the Indian Ocean as well. Simply noting that under the current structures of existing free trade agreements and Union members, many of these blocs have only a peripheral if any connection. Should there be a successful ASEAN integration, for example, then it would be an excellent candidate for EU / GU conjunction. The problem is that ASEAN is a supranational organization in name only, but essentially does nothing. Your attempt is interesting. I agree with your idea that importance of concept of nation seems to be reducing. It is indeed a good observation and is quite visible. Though I am not so sure that just implies some global authority has to come in. It is still not so clear what may finally emerge. What is clear is that nation no longer carries the weight it used to carry time being and may be some thing new might evolve. It may die too quickly if ti does, after all idea of nation is not so old. Even till 18th-19th century it was more of cultural idea. But I find it equally amusing that concept of globe also has some meaning more than just Europe, USA, Canada but you do not feel so strongly about it. I am reminded of Huston Smith a Professor of philosophy at MIT who once wrote that "Long after Bertrand Russel's contribution to Mathematical logic have been forgotten, his History of Western Philosophy may be remembered not for its content but for its title which, in the Western world was first to recognize that Western philosophy is not synonymous with philosophy generally". Looks like even philosophy there can be replaced by Globe for some discussions. Hi and thanks for your comment. Well, unfortunately or fortunately, the EU expansion seems to be geared only to certain areas. There has been talk of a Greater Arabia for decades and nothing has ever come of it. ASEAN has fallen down on its integration stand for about as long. There have been attempts to achieve this level of union in various blocs, but the EU is the only successful one so far. You talk of global union but your globe seems to be confined to North American continent and Europe and those countries where these countries have some heavy interest. That is where the first problem/discontent might occur. Many will think/discuss Globe is only for their country or what they are interested in, pretend others do not exist. I am reminded of an article some days back written by some Muslim guy who was pretending now USA economy and power has gone down and let us build a new economy with main currency for world being a Muslim common currency etc. Whether we like it or not, we are slowly moving towards a world federalism. This is certainly a chance for small countries. If the Polynesian states become members of the EU, the next step will be the integration of the commonwealth nations into a confederation which will have evolved beyond the European continent, accepting the Mediterranean states of North Africa all this will take time and sufficient suffering before national prejudices will have been replaced by the will to collaborate and cooperate. That's precisely what I was saying - British support for Turkish entry in the Union is a case of sabotage designed to derail French/German efforts for deeper E.U. integration. All the E.U. "directives" like the famous "straight bananas" one are anathema to Euroskeptics in Britain. Britain was also a major instigator behind the most recent wave of new-member entries such as Cyprus. There are at present no examples of EU member nations within which a separatist movement gained formal autonomy or independence which was recognized, aided, or "adequately addressed" by the E.U. You may be thinking of Serbia, whose province Kosovo seceded, and Kosovo was recognized by the E.U. - but Serbia is not an E.U. member. I thought Quebec nationalism is practically a dead letter at this point? I thought the failed referendum in 1995 took a lot of steam out of that movement. I simply don't find any support for the contention that the E.U. is becoming some sort of expansionist, global-integrating body. It's got enough problems already. The reason why the E.U. has been pursuing bilateral trade agreements with Chile, Canada, etc., is the same reason that the United States and China have - the Doha round of WTO talks has deadlocked. The WTO was supposed to be a world organization where all members would lower tarriffs together, boosting trade, boosting world integration, decreasing the likelihood of war, and ensuring fairer trade deals for small and poor countries. However, the Doha Round stagnated due to First World countries trying to force Third World countries to agree to intolerable conditions about intellectual property and trade in the services sectors. The WTO is actually the best negotiating arena for small and poor countries because there's a chance for them to negotiate as a block. By themselves, countries like Thailand or El Salvador find it much harder to negotiate favorable deals with a country as big as the United States. WTO members weren't supposed to pursue bilateral deals outside of the main WTO talks, but the U.S. has claimed justification for pursuing these deals (like the Chile deal in 2003) because of the Doha Round's stagnation. That's why these deals are going on. Sarkozy proposed a "Mediterranean Union" back when he first got elected President in France and this idea was roundly laughed down. If the E.U. refuses to give associate-member status for the countries of North Africa, where the benefits of economic integration with so much cheap labor are obvious, there's no reason to expect any sort of integration of the E.U. with Canada, Chile, or any other non-European country. I thoroughly appreciate your comments. However, I am very unclear on various statements you have made. British Euroskeptics are opposed to the UK's participation in Union affairs, so a support for Turkish entry could be construed as an act of sabotage. China's territorial claims effectively extend to a handful of minor locations and only one major one: Taiwan. This is a far cry from the EU which is rapidly gobbling up every nation within reach, and whose siren song of the free trade incentive is being heard as far away as Chile and Canada. The same questions have been raised for decades in the Quebec issue and it seems that the bottom line spells out the Quebec is a nation in every respect except that there is no supranational mechanism to allow for that structure at this time. Within an expanded EU / GU, this national aspriration could be adequately addressed. Your reading of European Union expansion politics is incorrect. The E.U. has struggled with the question of "deepening" versus "broadening" since its beginnings; for the past 20 years, expanion has been seen by many as a British "plot" to forestall further "deepening". The Union was hard enough to coordinate when there were 15 members on the European Commission; now there are 27. This is convenient for British Euroskeptics, who have long been among the chief supporters of Turkish entry into the Union. Expansion is inconvenient for advocates of deeper integration (historically French and German, the 'motor' of the Union), who wish to see more sovereignty consolidated at the central level, and Eurocrats who want to continue the work of harmonizing regulation and legislation at the European federal level. There is no world government or hegemon in the making, at least in Europe. There is no gradual 'seeding' of European colonies in the New World taking place. Seriously, look to China, and its territorial claims in the South China Sea. That is where you should be focusing your attention. I do agree with you that these localist autonomist movements are anachronistic. Advocates for Basque or Catalan autonomy, people who get hung up on the question of elementary schools teaching the historic ethnic languages etc., are missing the point of globalization. The Basque Country and Catalonia are better off for being part of Spain, and being part of the E.U. These nationalistic movements are lost causes which feed off of chauvinism and parochialism. While we deplore world government, we find that almost 40 nations are already in its grasp. These proposals are set to establish a framework whereby individual countries can maintain their identities and suzerainty with dignity. Global government was a Wilsonian idea, and Wilson was no benefactor of humanity. The League of Nations was a failure, the United Nations is a cesspool of corruption and a breeding ground for jihadism, and the EU imposes socialist stagnation and petty tyranny on the citizens of its member states. We don't need any more of this sort of thing. So where did I say that about Scotland? Scotland issues its own notes and that is a measure of autonomy. What's your point. You need to study up on your history as there was a stated goal of the Bush Admin. to erase the Canadian border. Furthermore, Canada would be way better off in the EU than it's current frozen loneliness hanging off of a xenophobic USA. What a load of rubbish. Right from the beginning - Scottish bank notes did not come about through secessionist pressure. There was no move under Bush to 'unite' with Canada. And a free trade agreement does not mean that Canada is about to join the EU.